The AI market is expected to grow to $9.88 billion in 2022, from last year’s figure of $2.61 billion. So how can solution providers take advantage of this growing market and increase adoption rates? The answer is simple: providers need to start presenting their solutions in the context of real-world business problems. 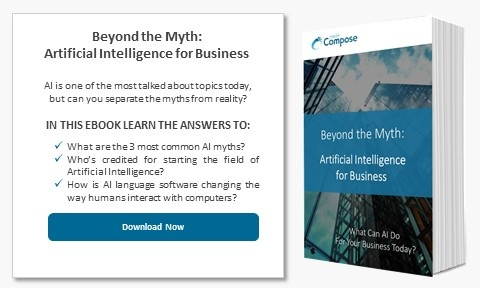 If you think about it, AI is one of the only technologies on the market where the conversation is dominated by technology not AI business use cases. For example, why are we talking about Machine Learning, Neural Networks, etc when we could be talking about uses? Imagine if Apple only sold the iPhone by talking about complex processor specifications? This tech-driven approach makes no sense for business looking to adopt AI since they are lost in techno babble, and it makes no sense for AI companies either. Businesses aren’t going to move forward with a “technology that solves everything” – they want to fix a certain pain point or focus on achieving a particular goal. Harvard Business Review recently published an article addressing this problem: AI should be talked about more in terms of the business world. The HBR chose to look at AI business use cases instead of AI technology, treating AI like any other computer software on the market. So often AI is discussed in terms of what it could be in the future, as opposed to how it can help businesses today. Surveying 250 business executives, HBR concluded there were three general categories that one can use to describe the type of AI projects that business is using today. Process Automation: these are repetitive, data-driven tasks, often done by the back-office admins or finance departments, that need to be done with some frequency (hourly, daily, monthly, quarterly). Robotic Process Automation (RPA) falls into this category. According to HBR, this type of technology is cheaper and quicker to implement, but lacks the “smarts” other types of AI can provide. Cognitive Insights: with the help of algorithms, companies can analyze large amount of data, quickly, to help identify trends and allow the company to have predictive power. This is often in the context of customers or potential customers, enable companies to personalize offers, ads, and predict buying behavior. Cognitive Engagement: this particular type of projects focuses on communicating directly with humans, providing or collecting information that can better help the business provide a personalized experience. This type of project can take the form of chatbots, personalized FAQ’s, and sales summaries. Based on our experiences with clients, we found these three categories to be true. The three categories do a great job encompassing a wide variety of business problems as well as helping set expectations for what AI can do for business today.